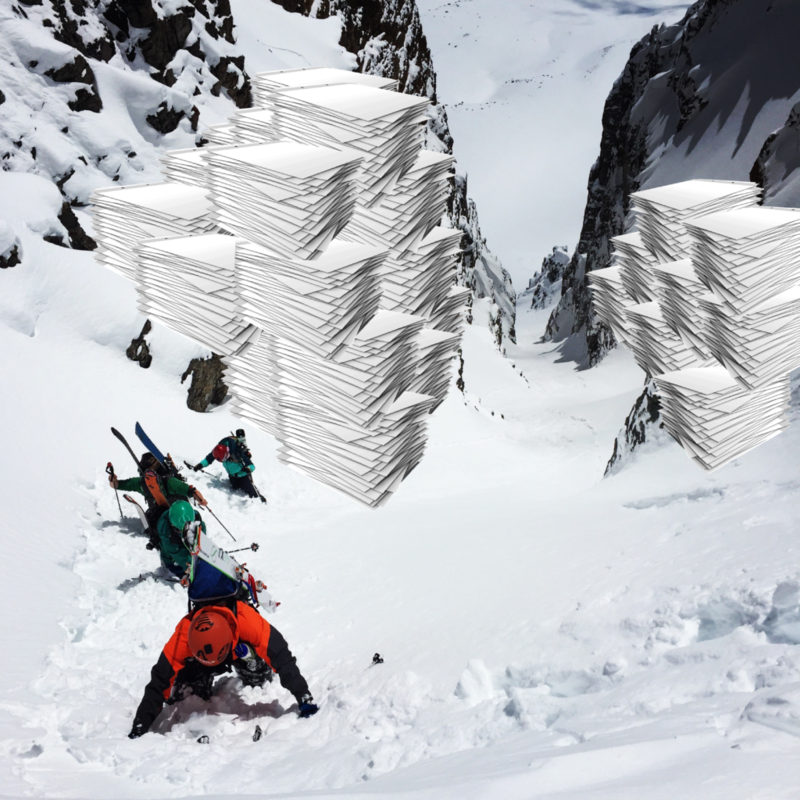 I first encountered workflow management as a backcountry ski guide spending too much time filling out forms and looking at weather forecasts. Habit #2 of The 7 Habits of Highly Effective People is to begin with the end in mind. I was looking at weather data and observation reports, but what I wanted to do was to go powder skiing. So, instead of enrolling in an online meteorology course, I focused on streamlining what information I needed, how I was going to get that information, and how I would use it to decide where to go. Here are 5 things I learned along the way that have helped me spend less time looking at weather forecasts and forms, and more time skiing powder and thinking about things like workflow management. It has taken a long time for technology to reliably reach the backcountry, but it has, and it is time to embrace it. Outdoor guides hone their skills through repetition and experience, and so it can seem unnatural to embrace methods that feel like short-cuts. There is undisputed value to doing things ‘the old fashioned way’, but by being dogmatic to that principle we miss opportunities to improve. Slack, Quickbooks, Salesforce, and others have completely changed how traditional office work gets handled, but with such an untraditional ‘office’, outdoor guides haven’t adopted, and rarely need, the same systems. However, just because we don’t have the same need, it doesn’t mean we don’t have any need. Outdoor guides live and work in a complex, and constantly changing environment. The tasks we do during the course of the day range from the mundane and routine, to the physically challenging and mentally exhausting. Atul Gawande argues in The Checklist Manifesto that complex work environments are best handled with a process to simplify those routine, but absolutely critical, steps. When faced with a complex decision, the more we can simplify a decision and the process of making it, the better we will be at balancing reason and emotion. Simple things like setting up my browser to open multiple tabs at once when opened, ensured that I would get all my ‘web tasks’ accomplished. I wouldn’t forget anything, and I would save time and mental energy by not having to repeat a routine, and sometimes lengthy, series of steps and clicks. Those steps and clicks didn’t just involve how I got information, but they mostly concerned how I shared, or otherwise communicated, information to others. The more I looked at how I gathered and shared information as a supply chain, the more I recognized inefficiencies and failure points throughout the process. The ‘office work’ part of being an outdoor professional is an often overlooked, and under-appreciated, part of the job. It is a means to an end. The task of streamlining your workflow isn’t about saving time, it is about being more productive and focused at work. I found that things like email and spreadsheets work great for individuals, but for groups they quickly become messy, misused, and distracting. If you have you ever struggled to find an important piece of information that had been emailed to you, or felt hopelessly lost looking through endless Dropbox, Google Drive, iCloud, or other shared folders for the right file, you know what I mean. While I am partial to Guide’s Guru, there are a variety of applications and tools available that can be used to simplify the process of gathering and sharing information for groups and organizations. As you do some research you’ll likely find how increasingly common it is to use APIs to integrate several services together. This allows you to truly leverage the ability of computers to talk to each other and perform tasks that would otherwise be ‘busy work’ for you. The inherent seasonality of the guiding industry further complicates efforts to reform how we work. The feast or famine schedule makes it seem as if there are only small windows when it’s appropriate to think about dedicating time to focusing on your work-process and creating a new workflow. And who wants to do that during off-season? However, it is when you are the busiest that the time, and sometimes frustrations, involved with all that gathering, sharing, and sorting of information are the most apparent. The challenge is to identify the leak while its raining, but patch it before the next storm. Building consensus to change how you document may be the most challenging step, but it will also be the most rewarding. With a standardized process for recording and sharing information you will be able to take full advantage of modern technology’s ability to network individuals, and leverage large datasets. As you start storing information in your new system, check that your data is being entered in the correct format, and that each entry has the proper context for a digital search. That means being able to answer who, what, when, for every piece of information collected. It will likely take some adjustments to ensure that your information is being archived in a way that is queryable and useful to review, yet still simple and easy to manipulate. Balancing those factors is the work of refining your workflow. The structure of your database is its foundation, but unlike a building, you can still change the foundation once the structure is built. Also expect that your data queries and needs may change as new tools and methods become available. Although you may lose some ability to leverage old data, refining and improving the process is what these 5 steps are all about. That ability to leverage old data will lure even the biggest skeptics towards these emerging technologies. Things like customer rewards programs have proven successful in creating customer loyalty and repeat traffic in other industries. It has helped operators better know their customers and adjust services to more closely meet their needs. When combined with reducing production costs by eliminating supply chain inefficiencies it sounds like Business Success 101. However, those programs are only made possible due to consistent and robust data tracking systems. Being more productive with a well-organized, and digitized, database does not mean becoming a data scientist. It means appreciating the long-term value gained from making small changes now. It means allowing modern tools to assist, but not alter, an old and skillful craft. Guides have always been very clever at finding ways to make new technologies work for them. There will surely be unique and novel applications of these new tools as well once they make their way throughout the guide industry. For more ideas and suggestions as to more ways to start using these new tools please follow us on Facebook, Instagram, and Twitter. Or better yet, contact us directly and let’s see how we can work together to help you get the paperwork done, and get back outside.